I was first introduced to the work of Rose Wylie a few years ago while visiting the Turner Contemporary in Margate. My boyfriend and I became fixated by here work, and in an accompanying video, her quirky character. I wanted to know more; who was this woman, over 70, grey disheveled bob haircut, making these incredibly surreal and at time child-like paintings? There are many things I find appealing about Wylie. She is unassuming, funny and quite frankly gives no shits. She is exactly the kind of elderly lady I love. Born in Kent in 1934, she studied at the Folkestone and Dover School of Art from 1952-1956, going on to complete a MA at the Royal College of Art in 1981. She gave up painting to raise her family with her fellow painter husband, Roy Oxlade. They continued to live in Kent, in a cottage that doubles as a studio. Wiley works large scale, painting on un-primed and un-stretched canvas. She used to paint on the floor, but now changes the canvas floor to ceiling (having had a number of hip replacement, this is easier now) I enjoy the spontaneity of her works, she isn't concerned with getting it right and painting accurately, she simply captures a mood, often inspired by celebrities and film. In her work, you can see where she has covered up areas she is unhappy with, gluing down paper or pieces of canvas and painting over it. Theres no starting over. Wylie didn't become known to the art world until the grand old age of 76. She was the only woman from the UK featured in the exhibition 'Women to Watch', held at the National Museum of Women in the Arts, Washington D.C in 2010. Since then, she has been exhibited at the Jerwood, Tate Britain and as mentioned, Turner Contemporary as well as galleries around the world. 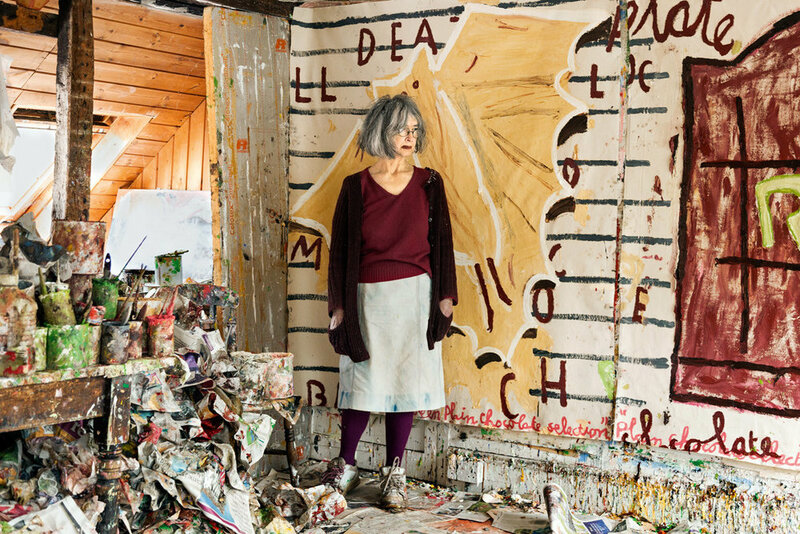 What inspires me most about Rose Wylie is the notion that success has come to her later in life. She put aside her artist career ambitions to raise her family, to do what was best for them, but never her creativity.